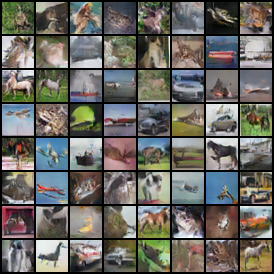 Generates images the size of the MNIST dataset (28x28), using an architecture based on the DCGAN paper. Trained for 100 epochs. Weights here. 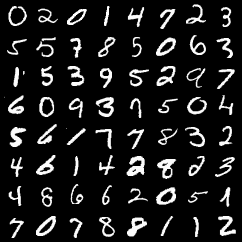 For comparison with a less complicated architecture, I've also included a pre-trained non-convolutional GAN in the mnist_mlp folder, based on code from this repo (trained for 300 epochs). 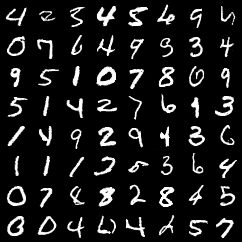 I've also included a pre-trained LeNet classifier which achieves 99% test accuracy in the classifiers/mnist folder, based on this repo. 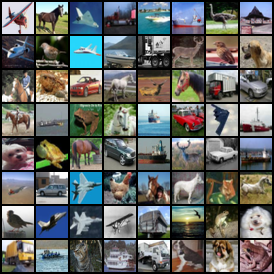 The cifar10 gan is from the pytorch examples repo and implements the DCGAN paper. 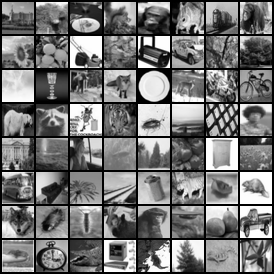 It required only minor alterations to generate images the size of the cifar10 dataset (32x32x3). Trained for 200 epochs. Weights here. I've also linked to a pre-trained cifar classifier in the classifiers/cifar folder from this repo. 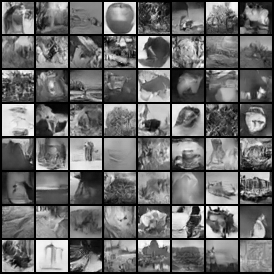 Similiar to the above gans, the cifar100 gan here generates 32x32x1 images for generating grayscale images. Trained for 200 epochs. Weights here. There are also weights/code for generating images which are 34x45x1.